It is official! The treatment room at Footworks Chiropody is now open for business! All therapies are now available, every Friday, so come out of the cold and banish those wintery blues! Speaking of blues, I thought it would be useful to guide you on how to use Aromatherapy at home. The next few months are particularly difficult thanks to shorter days and of course, the decline in weather, so read on for some practical tips on how to keep a healthy body, mind and spirit. If you wish to unsubscribe from my newsletter, please refer to the bottom of the page where you will find a link directing you to the relevant form. If you like my short and snappy newsletters then please keep on reading! If you have any questions in relation to anything that I write about, please email me at: holli@holliyoungholistics.co.uk and I will respond as soon as I can. For further information regarding the treatments that I offer please visit my website here. Click on the highlighted essential oils to read more about their individual properties: all links go to Penny Price Aromatherapy. 1. Choose your favourite festive essential oil and put a few drops onto a small piece of cotton wool. Then place the cotton wool onto your warm radiator (ensuring it is not a fire hazard) and the room will instantly smell amazing! Not only will it be an aromatic sensation, some essential oils have either antibacterial, anti-viral, expectorant or decongestant properties; so by filling your environment with them, you could be warding off cold viruses - win:win! Cinnamon, Clove Bud and Ginger are warming and spicy ... Frankincense, Myrrh and Eucalyptus are decongestants and festive ... Lemon, Lavender and Rosemary are antibacterial, anti-viral and just smell great! 2. We all hate dry, chapped hands so why not put a couple of drops of Lavender essential oil into a teaspoon of carrier oil and smother your hands with it twice a day. You can use Grapeseed for a lighter option or maybe Jojoba for a really enriching experience. 3. Going from the cold air outside to the warm central heating inside can often give you a stuffy headache. When you have a cold, there is nothing worse than the bunged up feeling! Why not try massaging a blend of Peppermint, Lavender and Rosemary (1 drop of each) mixed into a tablespoon of Grapeseed oil, onto your temples, the back of your neck and wrists. This combination is an absolute winner with my clients. It is tried and tested! 4. If you are having trouble sleeping then try putting a few drops of Chamomile, Lavender, Geranium or Sweet Marjoram onto a handkerchief and put it inside your pillowcase. Do not put them directly onto the pillowcase because you might stain the fabric. 5. 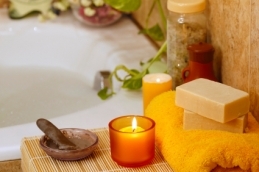 To warm yourself up during these cold months, a bath might be the only answer. Add 7 drops of the essential oil of your choice into running water to ensure even distribution. If you have sensitive skin, put fewer drops in and maybe do a patch test first to avoid an unwanted reaction. The steam created by hot water baths is also a brilliant way to decongest your airways if you are suffering with a cold. Beauty treatments at affordable prices. It is conveniently located just off Kings Heath High Street, on Institute Road, and although it is not as big as you would expect, everything is perfectly arranged and it has a comfortably intimate feeling to it. 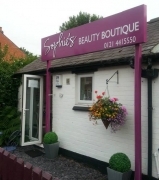 I have found Sophie to be very accommodating and always goes that extra mile for her clients. She can offer out of hour appointments and claims to work around her client's lifestyles which makes it so easy for you! So, if you fancy getting your nails done, getting a healthy glow throughout the winter with a spray tan, or just want an hour out of your crazy schedule to feel a bit pampered and loved....Sophie is the lady to sort you out! To book an appointment with her all you need to do is call: 0121 441 5550. Sweet and simple. Please visit her facebook page here. 20% off your first Holistic treatment at Footworks*. For location details and opening hours please click here. 1. Only valid for new clients, or existing clients when they recommend a friend and treatment has been completed. 2. Only valid at Footworks Chiropody on Holistic treatments offered by Holli Young Holistics. 3. You must quote: Winter15 when booking to qualify. 4. Offer runs until 20th December 2013 inclusive. Copyright © 2013 Holli Young Holistics, All rights reserved. You have received this email because you are a client/contact of Holli Young Holistics and/or Footworks Chiropody Clinic.